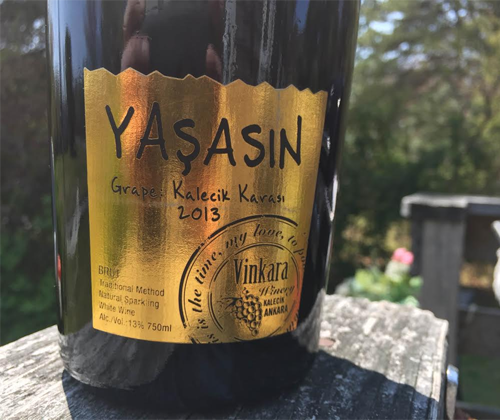 This is the sixth of seven reviews of wines from Vinkara in Turkey. To learn more about the history of Turkish wine, what's going on with it today, and more on Vinkara, check out Tarhun Returns: The Resurgence of Turkish Wine. FIRST. TRADITIONAL METHOD. SPARKLING WINE. FROM TURKEY. EVER. You read that right, bucko! 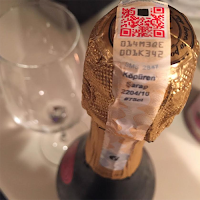 The traditional method, AKA méthode champenoise in Champagne, AKA méthode traditionnelle everywhere else, had never been done before in Turkey until Vinkara did it with Yaşasin. What's the "traditional method"? You can get all the in-depth details in my A Bubbly Biography - The Story of Sparkling Wine series but for a more brief description: it's the way to make Champagne style sparkling wine, with the second fermentation that creates the bubbles occurring in the individual bottles. You end up with a yeasty, bready sparkling wine as opposed to crispy clean Prosecco which is done in big stainless steel tanks. Rather than going with the usual grape suspects used for traditional method sparkling wine (Pinot Noir, Chardonnay, Pinot Meunier, Pinot Blanc) Vinkara was just like "Nah dude, I don't even care. We're gonna make it completely out of our Kalecik Karasi because this is Turkey!" and that's what they did. Kalecik Karasi (Kah-le-djic Kar-ah-ser) is indigenous to Anatolia and it's red, so this bubbly is a blancs de noir (white from red). It also has a vintage, something that you don't see very often with sparkling wine. When I translated Yaşasin, pronounced Yasha Sihn, this is what I got: hurrah, hurray, hooray, long live, thumbs up, two thumbs up, yip, yippee, huzza, legislate, dwell, exist, experience, live, subsist, taste, affect, inhabit. In this context, however, it means "long live". Do with that information what you will, but you know you're thinking of assassin. And assassin is way cooler. This is the Vinkara wine out of the entire bunch that I've been looking forward to the most. I was drooling over it when this month was being planned through email, and then I was told I wouldn't be able to get it because the new vintage wasn't even available yet! Then, miraculously, they were able to send me a bottle just in time to be reviewed with the rest of them. That made me sooooo happy. You don't even know, kid. See? That's my serious face. But inside I'm melting and wanna open this bottle with a sabre. Let's pop it. The color is a very very pale gold and in a regular wine glass there's tiny little bubbles that are climbing the walls of the glass, yet the carbonation is silent in the middle. I've never seen a bubbly leave thick legs like this one. And, before you start judging, I clean my glasses properly before and after using them. Smarty. In a Champagne flute the bubbles are larger and it spits them out like Mount Wannahockaloogie from Finding Nemo. On the nose there's almonds, orange blossom, blue raspberry and stone. Fantastic! When left still in the mouth it's full bodied and extremely high in acidity; when tossed around a bit to a froth it's profoundly creamy. The first thing I thought of in flavor was Cap'n Crunch, and even though I'm weird I do think it's accurate. There's also high concentrations of apple and blue raspberry. It finishes blue raspberry, a silky coating on your teeth, a frothiness in the back of your tongue, and acidity perched in the corners of your mouth. Pure bliss. I was not at all disappointed in the high expectations I had for this bubbly. It's loaded with character and, even though it's clearly showing respect and homage to Champagne and/or Cremant, it's also clearly doing its own thing. Vinkara has absolutely nailed this beauty, but the fact that it's $45 is holding me back from giving it the perfect score that I would like to give it. At that price I don't think you should rush out and buy it right now, but if you've got $45 and you're in the market for an awesome sparkling wine then I recommend the heck out of this one. Friggin love it.